Under the guidance of the camp swim instructors and aquatics supervisors all campers will be swim checked during their first in water swim time. 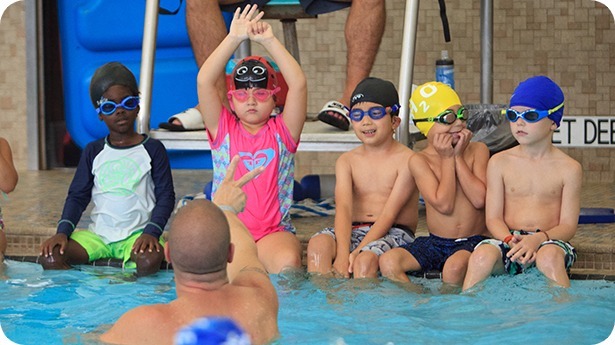 The Swim instructors will conduct a thorough but efficient swim test that allows them to properly place the child in a Rye Y swim level and corresponding Camp swim color. Swim Test will vary depending on age and camp group of camper. All pre-school swim tests are completed in the shallow end of the pool, Pa Cope is 3 feet at shallow depth and Brookside is 4 feet at shallow depth. If the child shows advanced swimming skills, then they will be asked to swim towards the deep end with an instructor. -Advanced swimming skills such as breaststroke kick and arms, butterfly kick and arms, elementary backstroke & side stroke. ALL CAMPERS WILL BE SWIM TESTED ON THEIR FIRST DAY OF SWIM under the guidance of the camp swim instructors and aquatics supervisors all campers will be swim checked during their first in water swim time. Begin with swimming 25 yards of a forward motion stroke. Must maintain a horizontal position and make forward progression during swim.Once successfully completing the 25 yards swim, Roll over on to back and kick for 10 yards.Complete the test with treading water for 1 minute.If they complete the skills listed above, they will receive a blue buddy tag and blue swim camp with their names on them to identify them as “Swimmer”. They will swim in the deep end of the pool. Ratios of instructor per camper the water will be determined based on age. Please reference ages listed above. Swim ½ the length of the pool unassisted and without stopping. Must maintain a horizontal position and make forward progression during swim.Roll over on to back and kick for 10 yards.Complete the test with treading water for 30 seconds.If they complete the skills listed above, they will receive a yellow buddy tag and yellow swim camp with their names on them to identify them as “Swimmer”. They will swim in middle of the pool. Ratios of instructor per camper the water will be determined based on age. Please reference ages listed above. Any child who does not demonstrate the above mentioned swim checks. Any child who does not want to be swim tested.If they are unable to complete the swim without stopping or struggle they will be classified as a non-swimmer and will not able to swim past the shallow end of the pool and be placed in the “RED” section. Depending on skills may be required to wear a personal floatation device during recreational swim. They will receive a red buddy tag and red swim camp with their names on them. Ratios of instructor per camper in the water will be 1:3.If participants swim abilities progress they will be retested and moved to proper section.If they complete the swim easily and use advanced strokes they may use the deep end of the pool and will be placed in the “BLUE” section for swimmers. They will receive a blue buddy tag and blue swim camp with their names on them to identify their swim level. Ratios of instructor per camper the water will be determined based on age. Please reference ages listed above.If they complete the swim at an intermediate level showing adequate strokes and technique with room for skill development they may use the deep end of the pool and will be placed in the “PURPLE” sections for swimmers. They will receive a purple buddy tag and purple swim camp with their names on them to identify their swim level. Ratios of instructor per camper the water will be determined based on age. Please reference ages listed above. If they complete the swim using unrecognizable strokes with a yellow or purple bubble with little assistance from counselor they will be placed in the shallow to middle of the pool in the “YELLOW” section for swimmers. They will receive a yellow buddy tag and yellow swim camp with their names on them to identify their swim level. Ratios of instructor per camper the water will be determined based on age. Please reference ages listed above. If participants swim abilities progress they will be retested and moved to proper section.